Missional. I lost my job because of "missional". 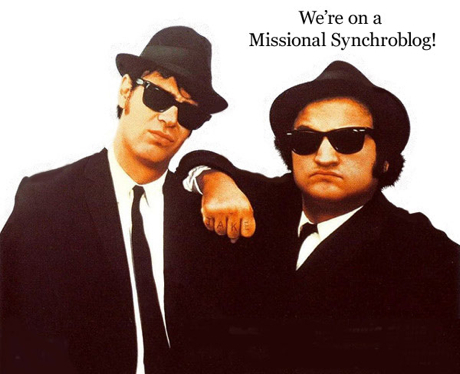 I will tell you how in a second but, first thing, before i start whining over losing my job at the Baptist Convention of Texas, welcome to the missional synchroblog, organized by Rick at Blind Beggar. My entry is one of the latest (stuck in Aberdeen due to airport strike, stayed in youth hostel and said no to their £5 an hour internet rate) so I am adding my thoughts to what others have said and then am giving a medley on what i have said about this word over the past 5 years. In fact, I lost my job because of a so called 'missional' transition. BGCT, who I still love and remember fondly my 8 years of mission service, and have no hard feelings against whatsover (they gave me plenty of warning and treated me respectfully throughout the process), decided to annex their entire church multiplication department, including myself, in the name of becoming "missional" and attempting to put the impetus for mission back in the megachurches. To be honest, I didn't think that decision was the most strategic. If the megachurches are the ones who now carry the torch for mission, where are the apostles who scout out the needs and help the church send out its people beyond its borders, over cultural barriers, and outside their comfort zone? Who will fight for the mission projects that will not immediately pay back into the system or will prove to offer a better alternative to the megachurches? Does being missional really mean firing the missionaries and adding their budget to the biggest churches? 1. It is often dumbed down by people who confuse it with "evangelistic" or "mission-minded"
2. It has often been purged by some evangelicals of its connections to the global mission movement (read 'Ecumenical') and given a newer and more acceptable face. The word "missional", until I am proven wrong [again], was coined by the Brits in 1883 and lay quite dormant until revived by missiologist Francis DuBois in the early 80's. Francis and I worked together in San Francisco in the mid 90's, when i ran the Page Street Baptist Center that he had started many years ago. Interesting story - a missional story that is - the feeding program we took over and grew ended up becoming a community, organized by its own people and led by Eric Bergquist who took over from me and is doing a fantastic job. Sorry - didnt mean to namedrop or start telling stories. Anyway, excuse the diversion. A century ago, people began to talk about missions at home and not just overseas. This thinking was later informed by the trinitarian emphasis of Karl Barth and emerged quite strongly at the 1952 International Missionary Convention in Willingen, a German town so small that even my German friend Andreas Wolf asked me yesterday, over breakfast in Norway, where the heck Willingen was or if it really existed. [Sorry]. Karl Hartenstein nailed it in 1954 with the Latin term Missio Dei (the mission of God) which drew meaning from the German term 'Mission Gottes' and stressed the idea that mission is God's initiative and the church is a participant in this mission rather than the originator. Lesslie Newbigin was also a participant at Willingen and would later be a major figure in bringing attention to the idea of missions in our own post-Christian cultures. His writings inspired some North Americans to explore the same themes under the Gospel in Our Culture Network. One of the books published was called The Missional Church and the name gained currency in USA. Further study was done by Milfred Minnatrea, who also lost his job in the missional shift at BGCT, in his book called Shaped by God's Heart. Milfred showed the word "missional" had reappeared in the writings of Charles Van Engen in 1991. Van Engen actually taught my wife at Fuller School of World Mission. Sorry - there I go again. One day I will show you a missions book from Lesslie Newbigin's library that is now in mine. And yes, he had signed it and underlined key passages! But I diverge from shameless name-dropping to finish this post. During these last two decades, the word emerged in UK as "mission-shaped" thanks to my ex-DAWN buddy Bob Hopkins and Bishop Graham Cray and some others. But the meaning was essentially the same, except the UK focus on "mission shaped" carried that incarnational idea that the new or emerging church is shaped by the context it enters. Read about it here. I have blogged my thoughts many times so I wont repeat myself. But I will say that the most exciting thing I have read recently has been from Chris Wright who, in his excellent book "The Mission of God", calls for a missional hermeneutic . From here, you can view what others said about the word "missional".